I have been in Charlottetown, Prince Edward Island for a couple of days on a business trip. 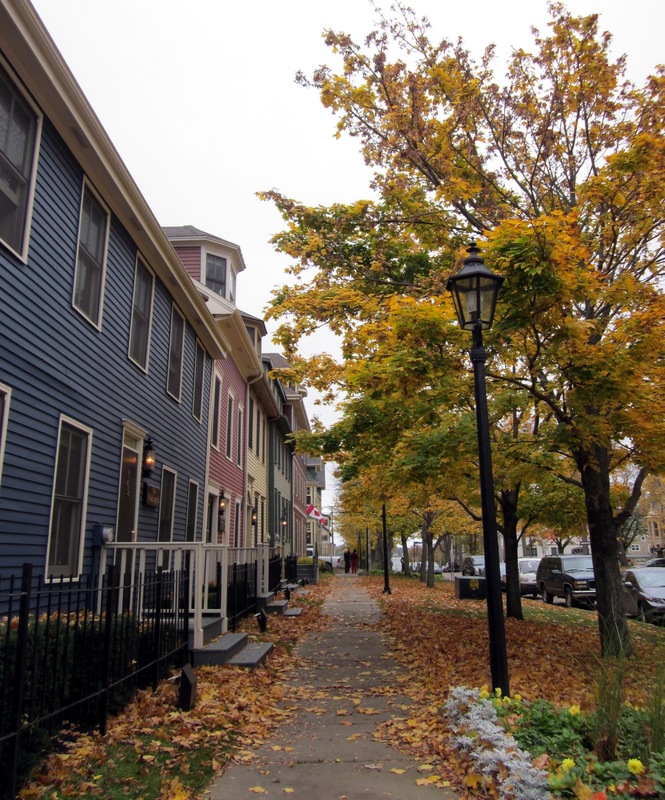 I wasn't sure what it would be like to be in Charlottetown on Hallowe'en, but discovered that it has an almost perfect atmosphere to get in the spirit for the occasion. The downtown area is full of beautiful old buildings, just right for ghosties and goblins. 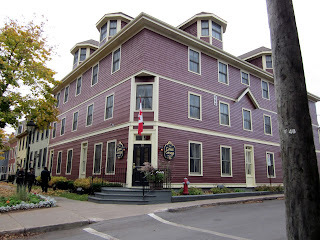 For example, this is the Great George Hotel, where I stayed. It is a wonderful place and I really enjoyed my stay here - but it was fun to imagine it haunted by ghosts. There are a lot of historical buildings in Charlottetown, the cradle of Canadian Confederation. 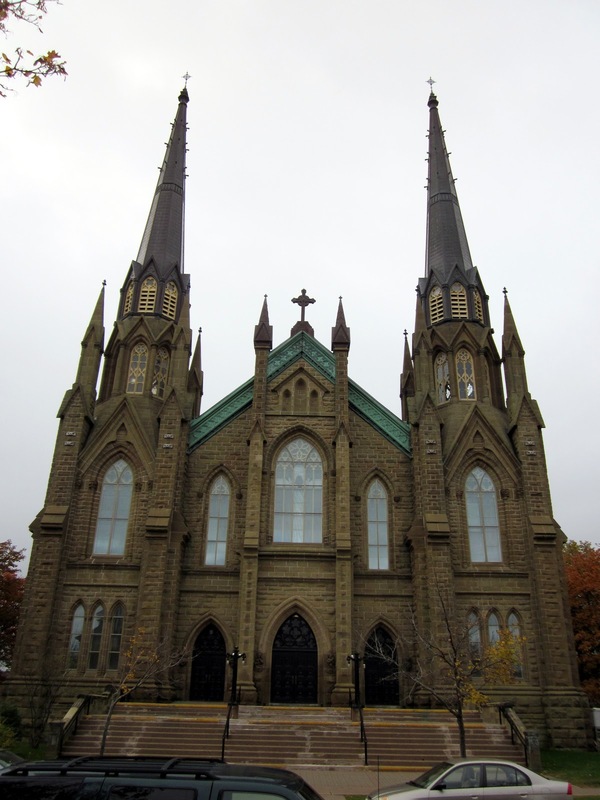 This wonderful cathedral is across the street from the Great George Hotel. I went out for a walk today on my lunch break and saw something in front of the cathedral. 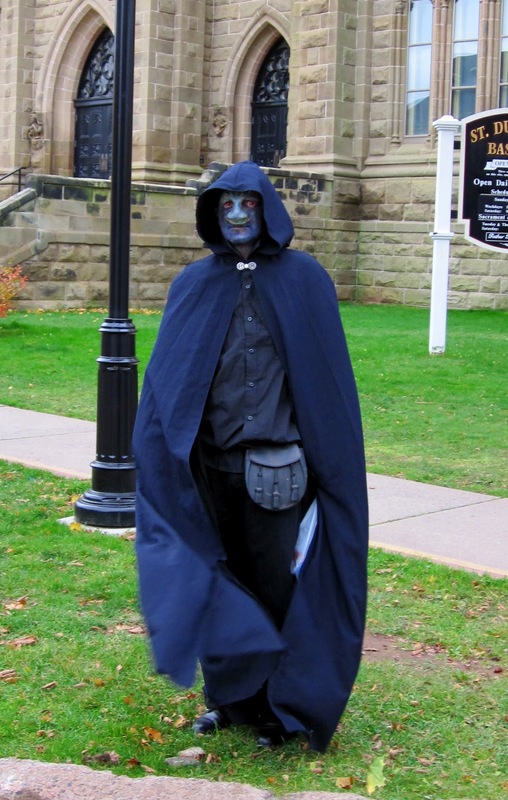 It was a Hallowe'en monster, all dressed in a long cape and a creepy green face. I asked if I could take his picture and he very kindly agreed. 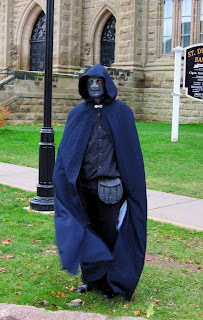 The Charlottetown ghosts are very friendly! 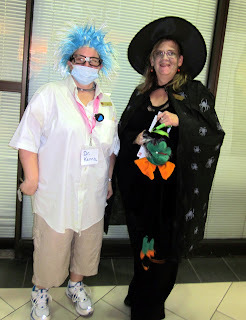 I continued my walk around the neighbourhood and encountered some more Hallowe'en creatures. They also kindly complied when I asked to take their pictures. They told me they worked in one of the stores nearby. This carved monster statue was a few blocks away. Not really a Hallowe'en ghost, but it somehow fit the spooky, eerie mood. Oooh, have fun in PEI! I like all the spooky costumes and the monster statue is very cool. Reminds me of a totem pole.